Lil Pip Designs: To Blythe or not to Blythe? 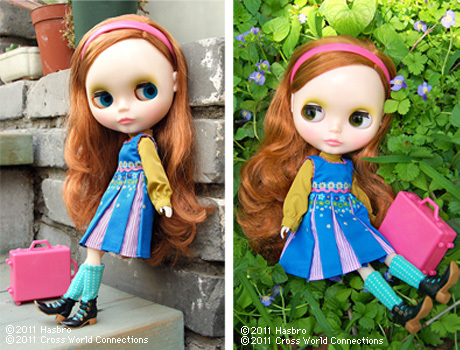 So thanks to Jannelle Wind and her gorgeous Crafty Girl, Emily - I'm starting to get a little obsessed with Blythe dolls. I rather like Phoebe Maybe mainly because of her beautiful long red hair - just like mine and nothing like my two owlets ended up with! But I will admit, I don't know where to start or what to do when it comes to these amazing dolls. Perhaps I need to join the We play with dolls forum but that seems like a bit much just for a doll.I'm guessing since they are a relatively new release, the price on eBay is reasonable? Thank goodness I don't lust after one of the original vintage ones like this one. I don't think Hubby Owl would agree to spending $4,700 + on a doll! I simply love the idea of collecting a doll or two (that would be worth a lot in the future) and making little things or collecting little outfits, that I could then pass on to my little owlet in the future (at just 2 years, I'm not trusting her with her own!). So can anyone help me on my Blythe quest?